Rubber mats can also be ideal for those with pets or kids. 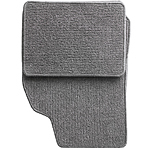 Carpeted floor mats tend to look nicer and are easier to customize. They can come in up to 50 different colors to better match the interior of your vehicle. Rubber floor mats only come in tan, black and gray. A carpeted floor mat can be personalized with your name or a logo. Furthermore, they may be available from both the dealership as well as third-party suppliers. Therefore, they may cost less than rubber mats.